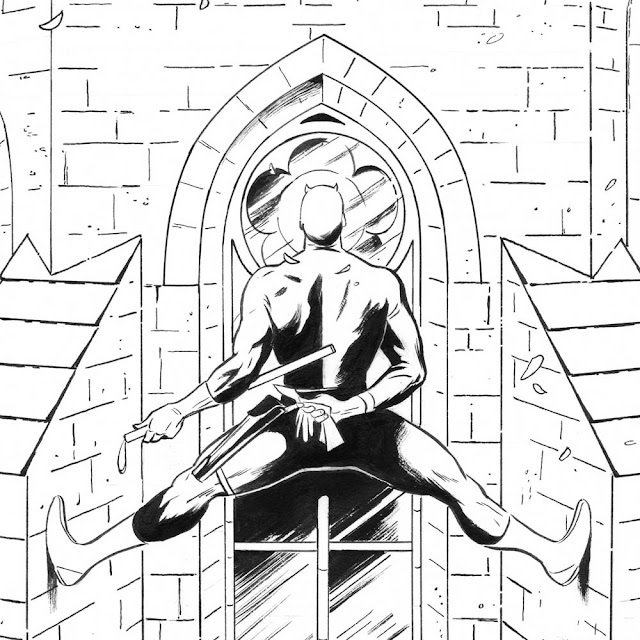 Daredevil #1, Page 1 (detail). 2011. Ink(ed by Joe Rivera) on Marvel board, 11 × 17.25″. Last March, as we were just getting Daredevil under way, I spent a month at my parents' home in Florida. Below is a pic of me trying to get the right pose from behind. I often have trouble with backs (backs pain? 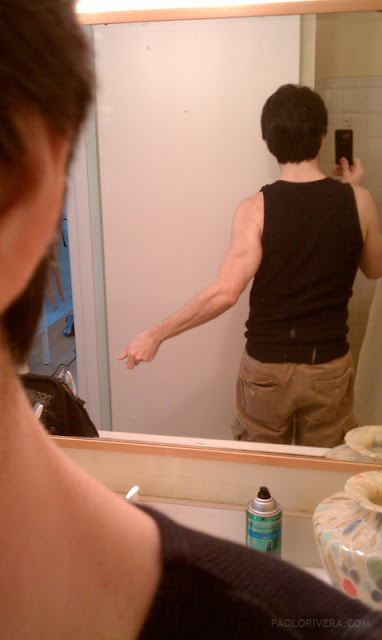 ), especially when the arm begins to overlap the latissimus dorsi. I also took reference for the right hand, but it was more critical for a close-up on a subsequent page. sure my mom is vacuuming in the background. I was also spared that gene. Below, you can see the various initial stages, from design, to perspective grid, to rendering. At this point, I was still tracing my digital composites via light box, a step I now skip thanks to my printer. 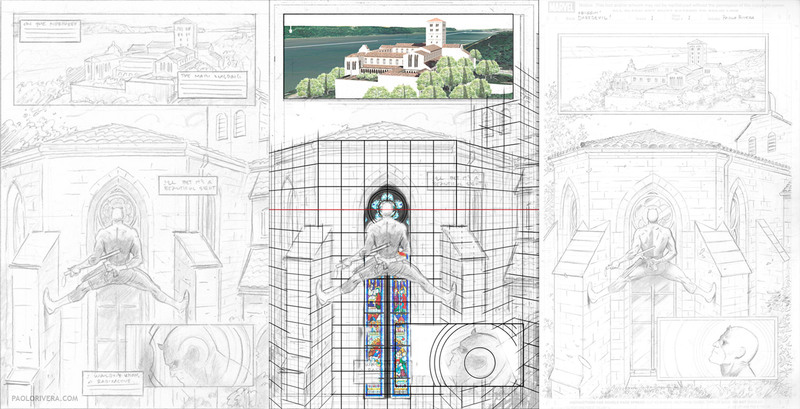 You can also see my original intention to draw the stained glass window. Deadlines divested me of that notion. The Cloisters set the scene for our hero's first adventure, and I used Google Earth to find a suitable vantage point. The action takes place inside the main courtyard, but I used the southwest corner for the first shot of Daredevil. Additional details were found by scouring people's pics of the Cloisters on-line. I still haven't been there myself. 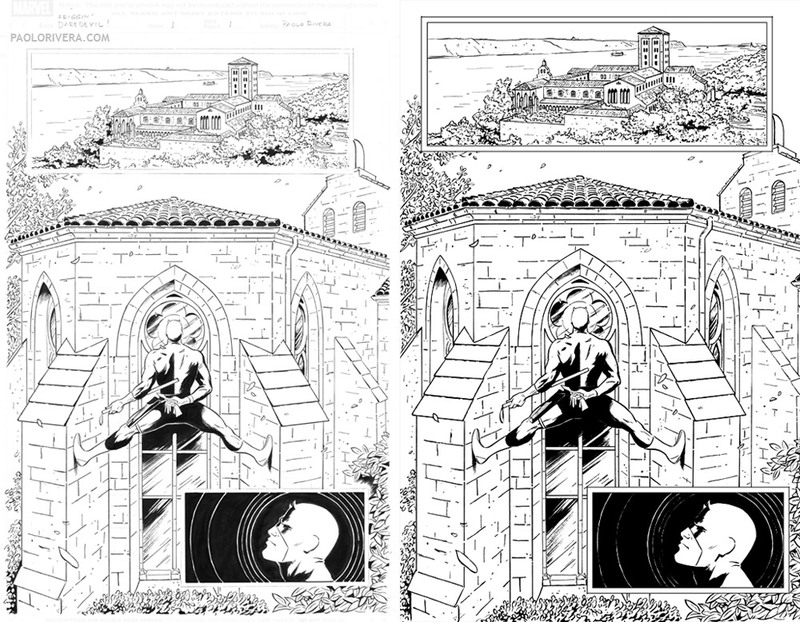 Last but not least, my dad inked over the original pencils. Since I was home, it was easy enough to hand it over, assembly line style. I ended up creating the borders digitally and doing minor edits. I quickly learned that my pencils needed to be tighter, since he couldn't always tell what I was thinking. For instance, in the bottom, right-hand corner, I had intended the tree to be in the foreground, not touching the wall. Like I said, minor edits. That was a fun page to look at. I wonder, if you had drawn in the stained-glass, would it have distracted from Daredevil right in the middle? I work at a comic book shop, and this page has been the subject of so many conversations between myself, my coworkers, and our customers. I love the "Wacky Reference Wednesday" posts. They let me see a side of the comic making process that I otherwise would not. Thank you! Thanks, Susie. That's precisely why I started the series of posts. Glad to hear it made an impression.